Ystradyfodwg Art Society: Dawn Boreham . Mixed Media. Dawn Boreham . Mixed Media. Dawn Boreham leads a group of people at her popular Arts and Crafts Workshops here at our Studio in the Abergorki Hall, Treorchy. 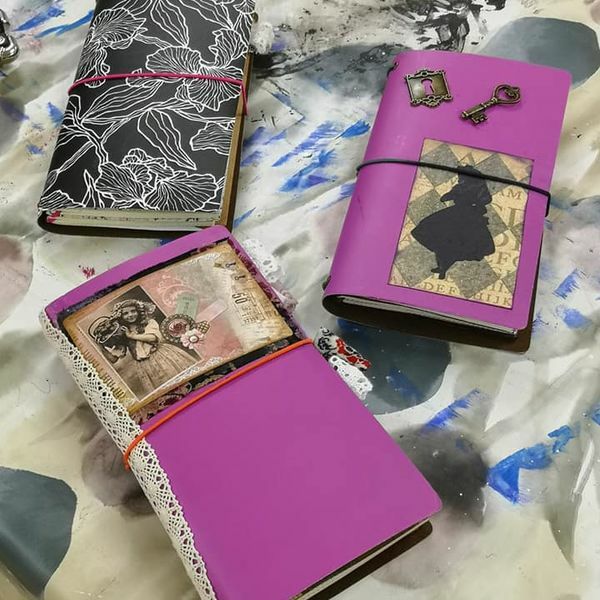 Her classes range from taught projects, group projects, painting, making, drawing, note making and the production of an individual Inspirational Journal that often leads the way to making and creating new art, new craft and new art objects. It is a friendly, relaxed, though productive atmosphere, where all participants work at their own speed, with help from Dawn whenever its required. Refreshments are available at the Studio. The Monday afternoon class is a Project inspired class where all materials are provided, and all participants work towards the same conclusion. At present there are 7 members but all are welcome to join this friendly group. Once a month on a Saturday, Dawn leads a Workshop where the activity is decided by the group. There’s also plenty of time to chat, share ideas, share stories, and indulge in an activity that is both social and productive. The social aspect of the Saturday class often leads to ideas about artwork, projects, craftwork and sculptures, these sessions often shapes the activity timetable for future Workshops. All Workshops are held at our Studio at the Abergorki Hall, Treorchy. Please check the Timetable page on this site in case there have been any changes.